Modern Machine Shop 73 Shopfloor Efficiency Taking a Punch Linda Tool was founded in 1952 as the Linda Tool and Die Corp., a name that later would change to ref lect the shop's shifting focus from tool and die operations to precision machined compo- nents, predominantly for aerospace, oil and gas, and machine building. Mike DiMarino started working for Linda Tool and Die in 1975, at the age of 17, at a time when he was one of three employees under the stewardship of its then- owner, Mr. DiMarino's soon-to-be father-in-law. Over the next 13 years, Mr. DiMarino learned to work every position on the shop f loor as well as the front office, eventually taking control of the company in 1988. 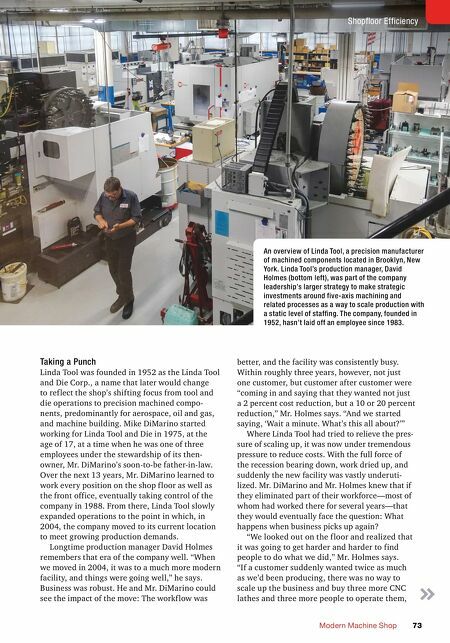 From there, Linda Tool slowly expanded operations to the point in which, in 2004, the company moved to its current location to meet growing production demands. Longtime production manager David Holmes remembers that era of the company well. "When we moved in 2004, it was to a much more modern facility, and things were going well," he says. Business was robust. He and Mr. DiMarino could see the impact of the move: The workf low was better, and the facility was consistently busy. Within roughly three years, however, not just one customer, but customer after customer were "coming in and saying that they wanted not just a 2 percent cost reduction, but a 10 or 20 percent reduction," Mr. Holmes says. "And we started saying, 'Wait a minute. What's this all about?'" Where Linda Tool had tried to relieve the pres- sure of scaling up, it was now under tremendous pressure to reduce costs. With the full force of the recession bearing down, work dried up, and suddenly the new facility was vastly underuti- lized. Mr. DiMarino and Mr. Holmes knew that if they eliminated part of their workforce—most of whom had worked there for several years—that they would eventually face the question: What happens when business picks up again? "We looked out on the f loor and realized that it was going to get harder and harder to find people to do what we did," Mr. Holmes says. 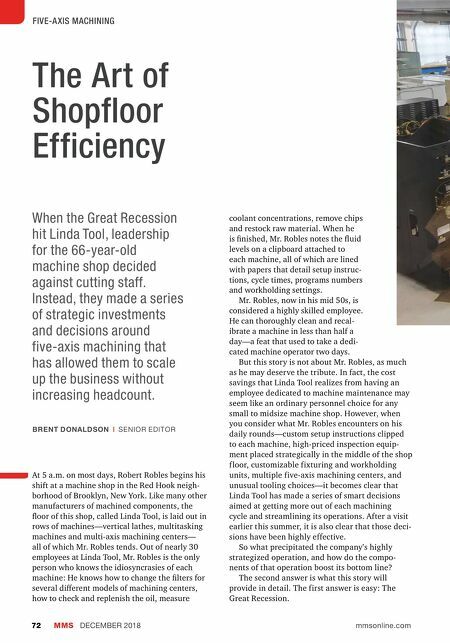 "If a customer suddenly wanted twice as much as we'd been producing, there was no way to scale up the business and buy three more CNC lathes and three more people to operate them, An overview of Linda Tool, a precision manufacturer of machined components located in Brooklyn, New York. Linda Tool's production manager, David Holmes (bottom left), was part of the company leadership's larger strategy to make strategic investments around five-axis machining and related processes as a way to scale production with a static level of staffing. The company, founded in 1952, hasn't laid off an employee since 1983.